Comm Bank was the target of yet another street protest in Church St, Brighton today. 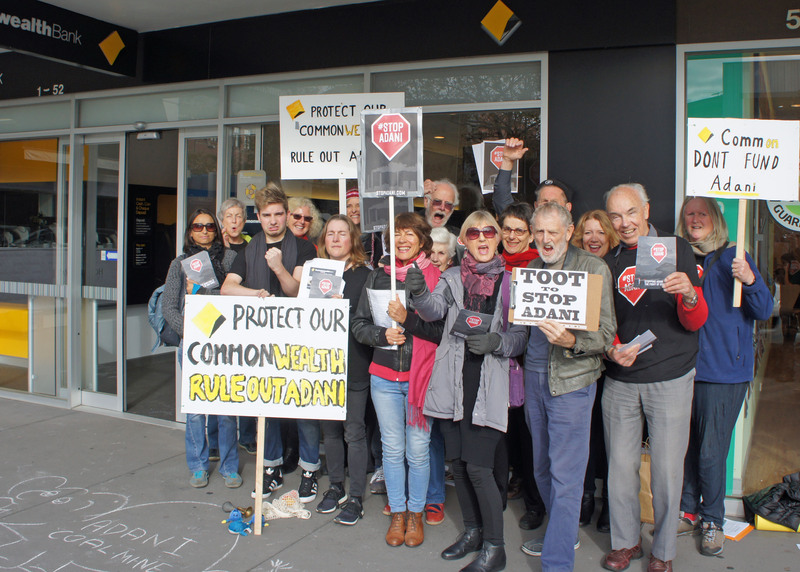 Some 20 participants as well as passers-by and bank customers heard calls to the bank to rule out funding the Adani coal mine from 3 speakers. 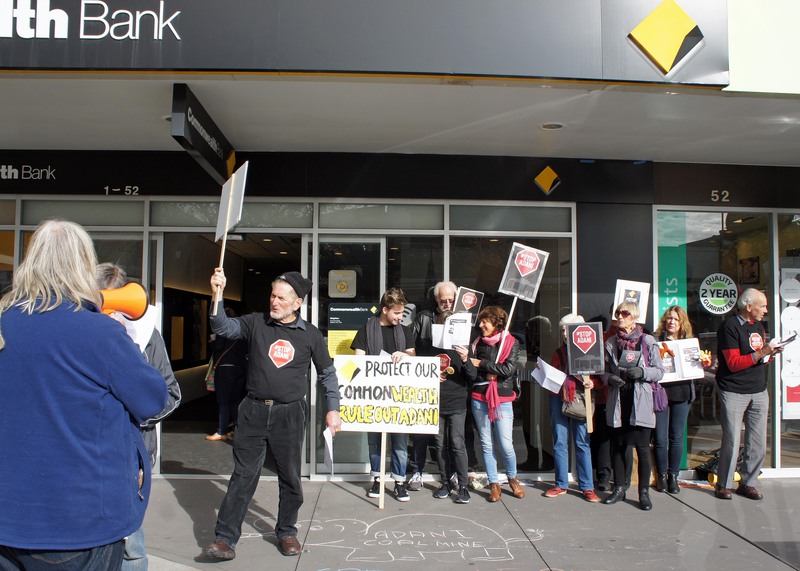 They called on Commbank to follow the lead set by Westpac last month and a number of large international banks who have refused to fund new coal mines in new basins, such as the Adani Mine in the Galilee Basin. The action was organised by David Rothfield and David Williams of the Bayside Climate Change Action Group. 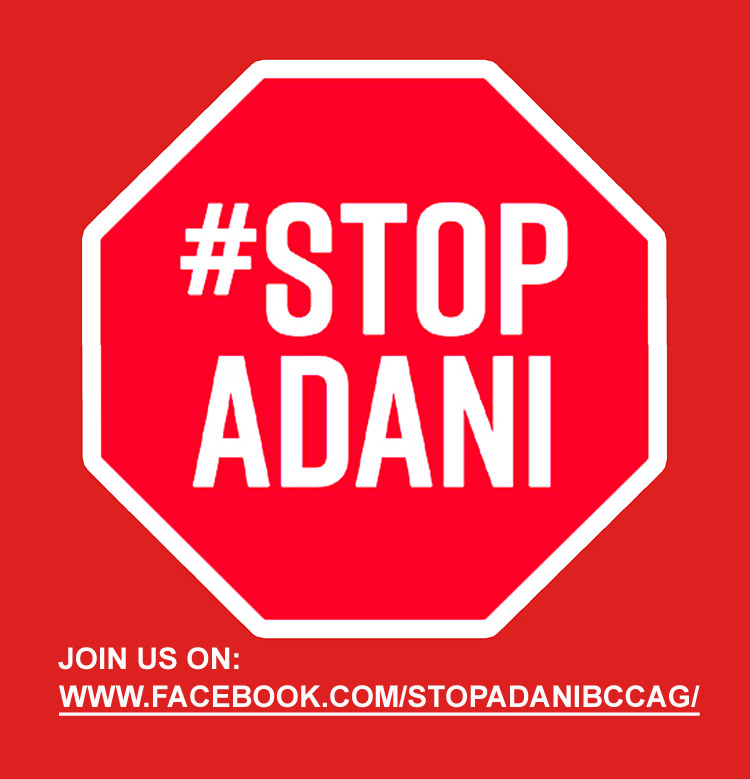 A campaign to stop the Adani Coal Mine project going ahead has been mounting with over 100 such groups now participating nation wide. Studies show that the emissions that would be produced from this mine would kill any chance we still have to limit global warming to less than 2 C.
Williams, talking to those gathered and passers by said that India does not want our coal. They have their own and they are rapidly deploying cheaper wind and solar energy into rural villages. And they don’t want the pollution from burning coal, nor the massively costly distribution infrastructure that comes with large, central coal burning generators. Rothfield asked how the Minister For Energy can, in one breath, reconfirm Australia’s commitment to the Paris Agreements, whilst in the next breath, support a loan using tax-payer funds to help build a massive, new coal mine. The mine, if built would encourage the burning of more coal at a time when both Australia and India have pledged to cut their coal consumption to zero by mid-century. The Commonwealth Bank no longer invests in tobacco because it kills, said Monique Monnier. Climate change will also kill on a massive scale. Bank policy recognises the need to minimise and mitigate climate change. So investing in the Adani mine project would be a betrayal of the bank’s own policy. Furthermore, it would be a very risky investment. Many passers-by showed interest or support for the protest. Similar actions will follow nationally and in Bayside, until Commbank rules out funding the Adani mine project, once and for all.